This little love always puts a smile on my face. He is such a happy baby, has the sweetest smile, and a pretty awesome mom. 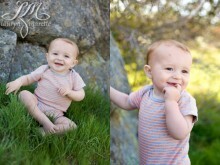 Judah is almost one year old, and I got to take some fun photos out in his grandparents' backyard in Tehachapi.